Deserted with Alex J Johnson. He was born December 16, 1835 in GA. to Robert and Martha Brown. He married Susan F. Tice born Jan. 12, 1838 in GA., daughter of William & Serena (Clayton) Tice. Their children were Mary M. Brown who married John M. Palmer; Fannie Brown who married William Lindsey and possibly another daughter named Martha F. Brown born September 01, 1864 after William's death. 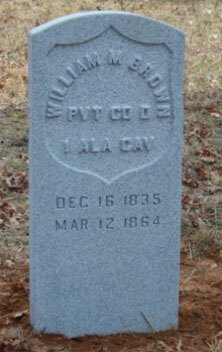 William Marion died March 12, 1864 at the hands of the homeguards, Marion County, AL, during the Civil War. Picture submitted by A great, great granddaughter Olva Nichols Jones.